I am not in the most creative of moods. I am trying to fight off a cold...but I don't think I am winning. I did manage to get to my art table last night -- feeling a bit spacey from some over-the-counter cold medication. I was thinking of when I was a little kid and the amount of time I would spend outside. I was fascinated by grasshoppers. I could stare at them for hours it seemed. These days I rarely, if ever, see a grasshopper. Is it because they are no longer around here where I live on the coast...or is it because my eyes are no longer as 'open' as they were as when I was a kid...missing so much in a hurried world...? 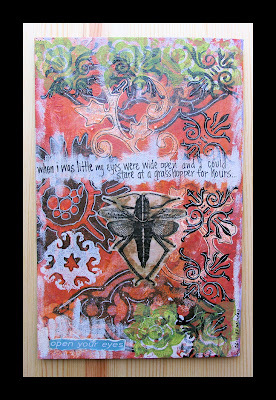 *the junk mail I used in this piece were the words "open your eyes"...the grasshopper is an image transfer I did onto unbleached muslin using clear caulking as the transfer medium. Wow! Simply wow! The amount of work and effort that you put into your pieces amazes me every time I see them. It is just so cool to have you joining in here now! Um, for not feeling artistic, I think it's an awesome page!! Oh, I love what you do with junk mail! I usually just chuck mine. Funnyou should mention grasshoppers. I have seen two in my backyard over the last week, basking in the sun. Sorry you are feeling a little punk (and Punk not in a good way). I hope you will feel better real soon! Pilar...first of all THANKS for stopping by! I figured this was another way to recycle the mounds of junk mail we get weekly...every little bit helps :-) Wish I was feeling Punk rather than punk ;-)thanks for the good wishes! You know, I cannot remember the last time I saw a grasshopper! When I was a kid they were everywhere. Beautiful rose petals. I love the combination of pink and yeallow. 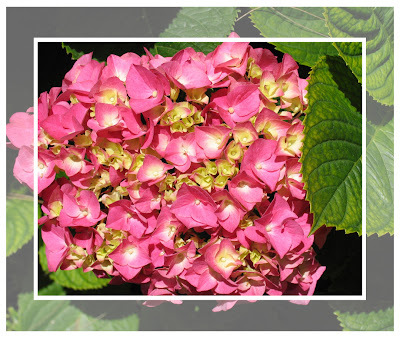 Ay Mija, no, Hydrangeas are not part of the rose family. Insert buzzard sound here. LOL! They're beautiful. Are they in pots or in the ground? They look so healthy. Your journal page is socool! Love the whole thing. It has been several days since you posted this entry. I hope you were able to fight off that cold! I am freshly back from my 20th anniversary and had a wonderful time. I've posted some pics on my blog. I love your new piece, as I always do! I have no shortage of grasshoppers in my garden, but, unfortunately, I'm not coastal. I would sincerely doubt that your eyes would overlook a grasshopper in the garden....which leads me to believe you must not have a one!! MijaLinda...the Hydrangeas were planted here directly in the ground before our family moved in. They are well established and beautiful! Glad you liked the grasshopper page :) Thanks! I am still fighting with this cold....but I do have some new art to put up very soon! And nope, still not a single grasshopper in sight around here! tica....feeling good as new...well, as new as a 57 year old can feel :)...thank you!